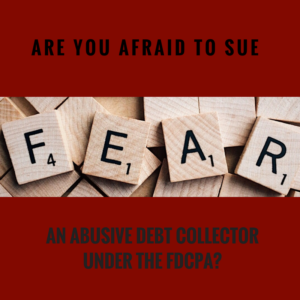 Are you afraid to sue an abusive debt collector under the FDCPA? So you’ve got a debt collector that’s collecting against you, which is fine if you really owe them the money and they are following the rules. But what if they violate the FCDPA (Fair Debt Collection Practices Act)? They cross the line by harassing you, calling your ex-mother in law and co-workers, threatening you, putting false information on your credit reports, etc. In addition, you’ve figured out that the debt collector isn’t just some guy in his basement, but a legitimate company. But you’re scared to sue them. We completely understand being scared. So let’s talk about this starting with understanding the motivation of the abusive collector. We want you to understand why they’re being cruel and abusive. This isn’t an accident, it’s intentional and planned out. They believe that if they make consumers scared/angry/embarrassed/frustrated/etc, they can make you pay money. Regardless of whether or not the collector actually owns the debt. So when they’re violating the law by calling your family and co-workers, putting false information on your credit report, and making outlandish threats against you, that’s no accident. It’s understandable that you don’t want to poke the bear because it’s terrifying to think about how much worse they will be after we sue them. I’ll tell you exactly how they’ll act once you’ve sued them. Because they know they’ve been caught. Since they’ve been caught, everything they do will be examined. If we sue and they call you, that’s a violation. The value of your case just went up. If they write you a letter, that’s another violation because you’re represented by us. Now they have to answer to a federal judge. We’ve seen some incredibly abusive companies that will be very quiet once we’ve sued them. We’re not talking about the guy with a prepaid cell phone that lives in his parent’s basement Instead, we’re talking about legitimate companies that act out this way. Now they’re having to figure out how to get out of this big mistake they’ve made. They’ll go through and see what they can say, such as making the claim that they never called you, they never called your mother-in-law, etc. All of which we have accounted for in the lawsuit. At some point, they have to realize that they can’t lie to get out of this. Now they want to figure out how to make this go away. If their settlement offer is lower than what you are willing to accept, then we go to trial with them. However, if their settlement offer matches our evaluation of the case, the case settles. When we sue these guys, they go away. We understand being scared, but we can assure you this abusive debt collector will go away if you sue them. They understand that they can’t continue to collect against you while you’re in a lawsuit with them. Part of our settlement is that they have to leave you alone, and they have to pay you money. When we do this, they know that if they try to collect against you again, we will sue them. They can count on that. We’ve had several companies that we have sued several times with the same person. We will gladly sue them again and again, as long as they’re breaking the law. If you have any questions regarding an abusive debt collector, feel free to give us a call. We would be happy to take a look at your case and help you figure out the best course of action.